We have 30 years experience in motorcycle frame, fork & wheel straightening, with a very good reputation in the road, race and classic scene. 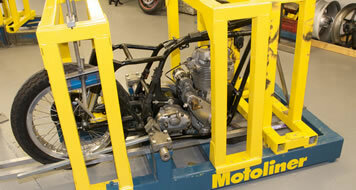 Maidstone Motoliner Ltd specialises in checking the alignment of motorcycle chassis and straightening bent or damaged motorcycles and parts, including chassis, frames, cast / alloy wheels, discs , forks , yokes, handlebars and many other structural items. For race bikes we can also check new chassis are accurate for the best possible handling using our specialised Motoliner Jigs. We are happy to help customers worldwide and can also offer ride in and same day services for many items for UK customers. With 30 years experience in the business we pride ourselves on the speed and quality of our service. Our customers include major insurance companies and their approved repairers, personal customers and the road race scene. We provide a quick and friendly service to get you back on your wheels as soon as possible. For more information on how our services can help you click on the relevant box on the right. We have been straightening frames for over 30 years and are very well regarded in the Race, Road and Classic motorcycle scenes. 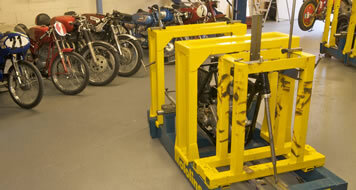 We make it easy for you to get your forks & yokes straightened with us. Either by sending them by post or dropping it down to us for a same day turn around. 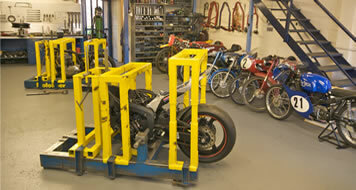 We have been straightening cast wheels since the early 70s when they were first introduced to motorcycles. Many kinds of front and rear motorcycle brake discs can be straightened using our services. Fed up with the way the rear axle moves and tightens up the chain when you do up the rear axle? We supply a new adjuster block that provides more accurate control of the rear axle.